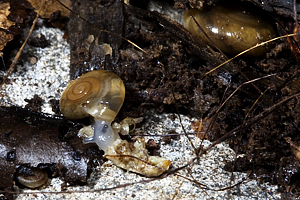 Slugs and snails are examples of Molluscs. Most of the living molluscs in caves are gastropods and many are omnivores – like man they feed on a variety of food types. 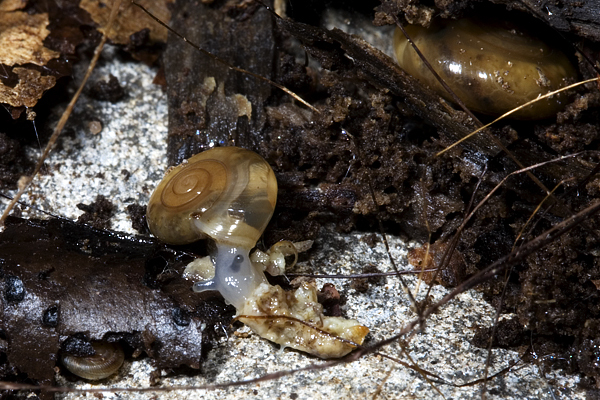 Most of the terrestrial cavernicolous snails are in the Zonitidae family (the Glass Snails and Garlic Snails), many of which produce chitinase enzymes that can digest the chitin in the exoskeletons of insects. The most common one in Wales is the Cellar Snail Oxychilus cellarius, which has been recorded in Porth yr Ogof, Ogof y Ci, OFD2 and others. Other representatives of this family that have been found in Welsh caves include the smaller O.allarius which smells of garlic (in Ogof y Ci) and Retinella nitidula. Slugs are seen in Porth yr Ogof but I am not sure if any have been identified. 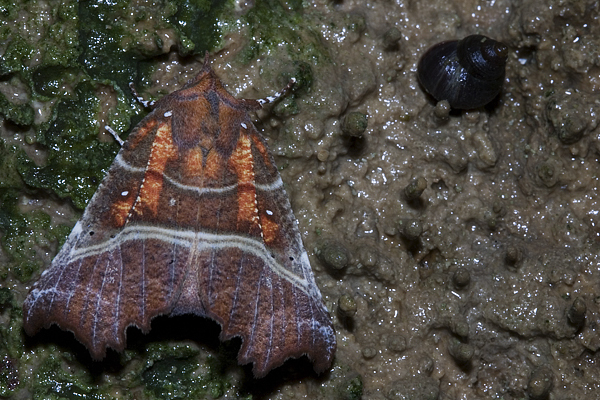 The following is a list of snails from Ogof Draenen: Cellar Snail Oxychilus cellarius, Point Snail Acicula fusca, Herald Snail Carychium minimum, Common Door Snail Clausilia bidentata, Rounded Snail Discus rotundatus, Lesser Bulin Ena obscura, Crystal Snail Vitrea contracta, Hairy Snail Trichia hispida, Furrowed or Strawberry Snail Trichia striolata. In caves near the sea the Rough (Littorina saxatilis) and Small Periwinkle (Melaraphe neritoides) can be found surviving above the high tide mark. 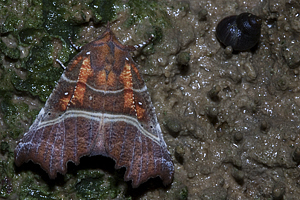 Herald moth and Rough Periwinkle in a Pembroke sea cave. They are at least 10m above high tide mark. The spiral fossils in seen in caves are members of a group in the Mollusc phylum called Gastropods (means 'stomach foot'). Their descendents are still alive and successful today and include snails, slugs and limpets. Inside the caves you will also see many fossils of another group of Molluscs - the Brachiopods (means 'arm foot', commonly known as lampshells). These creatures had two unequal parts to their shell but are unrelated to the present day similar creatures in the Mollusc phylum e.g. clams. They used to be very common but have been declining for the last 100 million years and will probably eventually become extinct. In the cave these fossils appear as circles and semicircles of white.